Here are some highlights of things to see in Carcassonne. 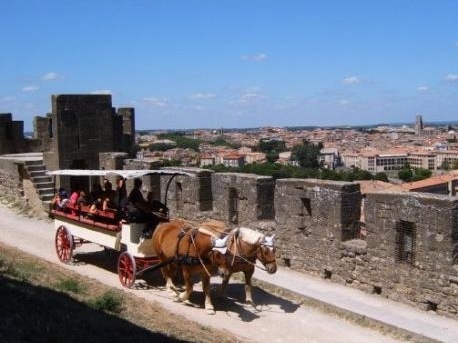 For more suggestions, check the Carcassonne Tourist Office. Don’t forget to allow some time for sitting in a café doing nothing – that’s an important part of a visit to France! The Cité de Carcassonne, one of the largest and best-restored medieval castles in France, is only 0.6 mi (1 km) walk from Maison Juliette. Every year, over 3 million people visit and are transported back in time. Admission to the Cité is free and it’s open 24×7, since a few residents still live inside its walls. Pick up a map from the Tourist Office, located just inside the main gate of the Cité, on the right. 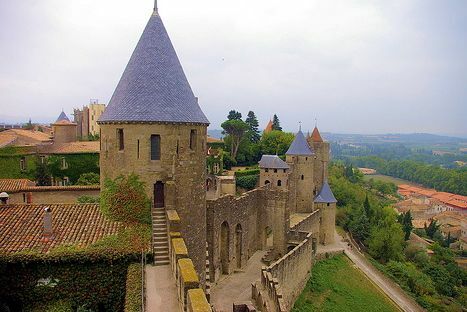 Visit Château Comtal (Count’s Castle), a “castle within the castle”, where the count controlling Carcassonne was protected from besieging Crusaders. This part of the Cité requires a ticket. Self-guided audio tours in multiple languages. Take the “little train” for a 20-min tour of the turrets and ramparts. Narration in multiple languages. Tour the Cité in a horse-drawn carriage. Discover buildings from all eras thanks to a comprehensive, 20-minute commentary. Route takes you between the two ramparts on the fortified walls. 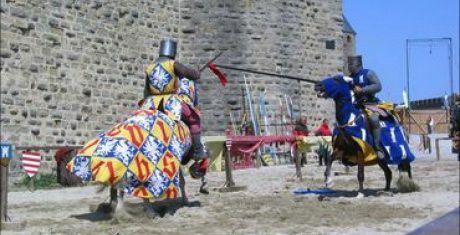 See the Tournament of Chivalry, a great show of 13th century arts: horsemanship, falconry and swordplay. Great entertainment for kids of all ages. Narration is in French, but understanding isn’t required to enjoy the show. Shows twice/day in summer only. Buy tickets next to cathedral the day of show. 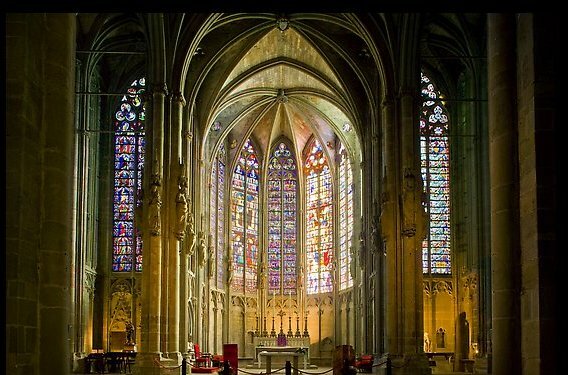 Tour the Basilica of Saint-Nazaire, cathedral from the 11th and 14th century. The jewel of the Cité ! See the School Museum, a reconstruction of a classroom in old times. Exhibition of documents, furniture and school material from the time of Jules Ferry. The Canal du Midi connects the Mediterranean to the Atlantic. Built in the 17th century, this 240km canal with 86 locks was the largest construction project of its day: 15,000 laborers worked for 15 years to build it. Even today, it is seen as a marvelous engineering accomplishment and is the most popular pleasure waterway in Europe. 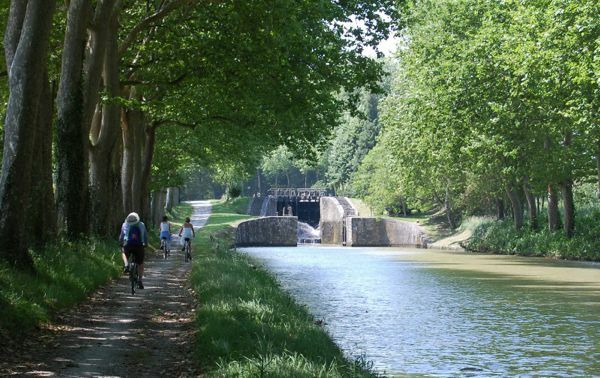 Tree-lined paths on both sides of the canal are great for walking and hiking, and it’s only a 0.5 mi (700 m) walk from Maison Juliette. 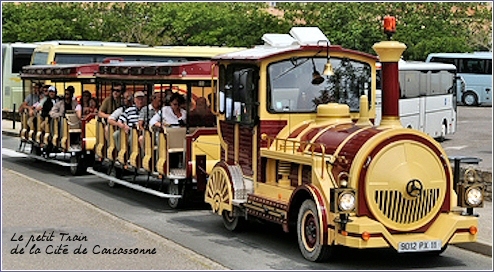 Carcassonne Croisiere offers a variety of short cruises along the canal, ranging from 1.5 -3 hours, some with lunch served. Departures 2-8 times/day. About 2 mi (3 km) from Maison Juliette, the canal actually goes over the river on an arched bridge. It’s quite a sight! Preview available on Google street view. The Musee des Beaux Arts displays European paintings of the 17th, 18th and 19th centuries. 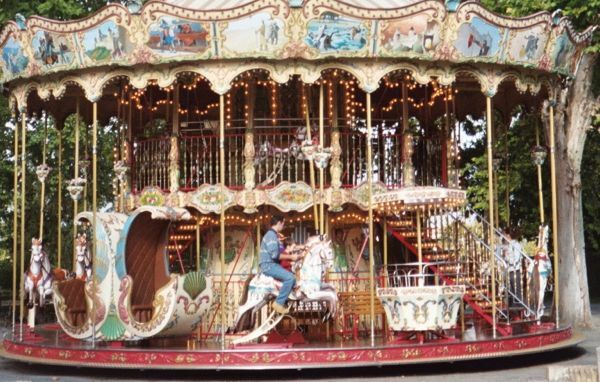 Located just south of downtown, the carousel is fun for kids of all ages. Only open in summertime.